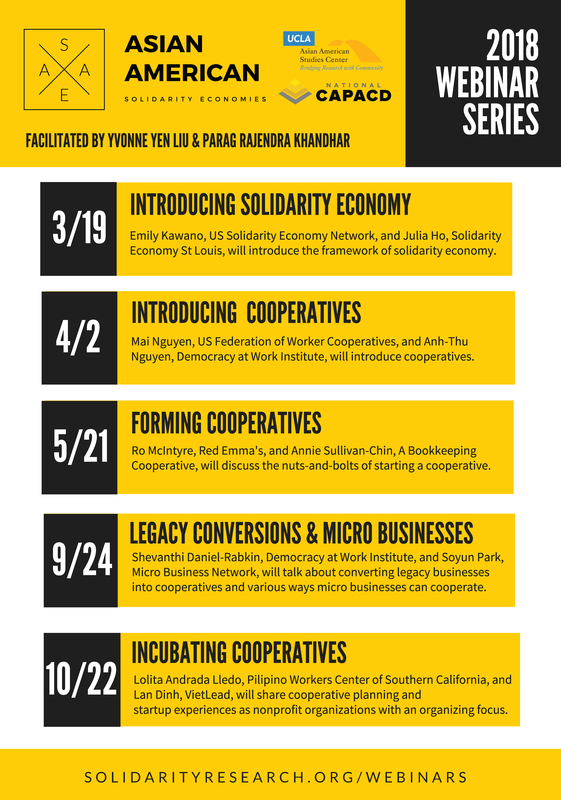 The Asian American Solidarity Economies Project presents a five-part webinar series in 2018 on solidarity and cooperative economics targeted to the assets and needs of Asian American immigrant and refugee communities. You can watch the recorded livestream on our website. 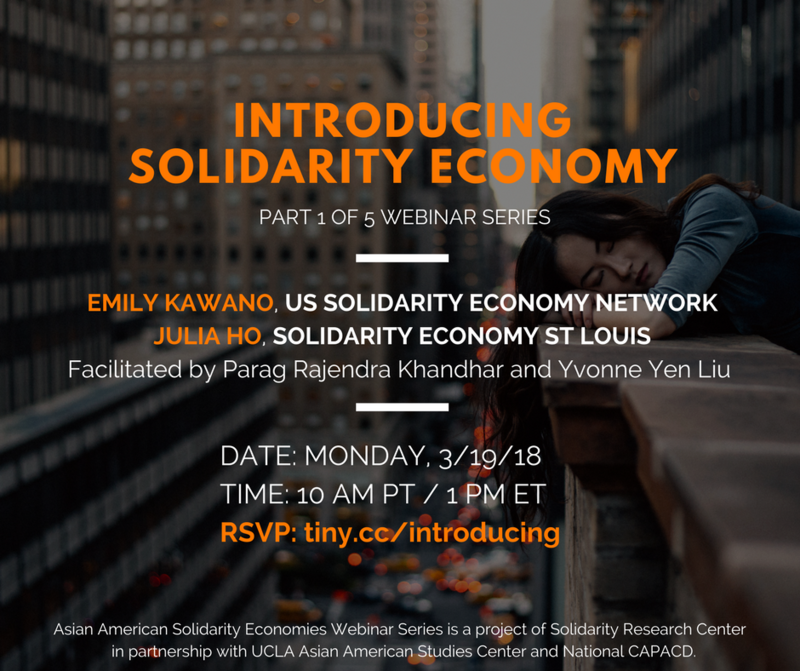 In our first of five webinars, our speakers will introduce the framework of solidarity economy, its history and contemporary practice, and examples in Asian American immigrant and refugee experience. You can watch a recording of the webinar on our website. In our second of five webinars, our speakers will introduce cooperatives, its principles and examples, and the cooperative ecosystem. Mai serves on the board of the US Federation of Worker Cooperatives. They own and operate an organic farm and were the cooperative development specialist at the California Center for Cooperative Development. Now, Mai is an organizer for the National Young Farmers Coalition. They specialize in agricultural and worker cooperatives, and primarily work with immigrant and small-scale farmers to create cooperative alternatives to the conventional food economy. Anh-Thu is director of special projects for the Democracy at Work Institute. She develops markets and opportunities for collaboration between cooperatives and cross-sectoral allies, including the development of a value chain within the textile and fashion industries. Born and raised in Tampa Bay, FL to Vietnamese refugee parents, Anh-Thu earned her BA at Georgetown University and JD at University of Texas School of Law. 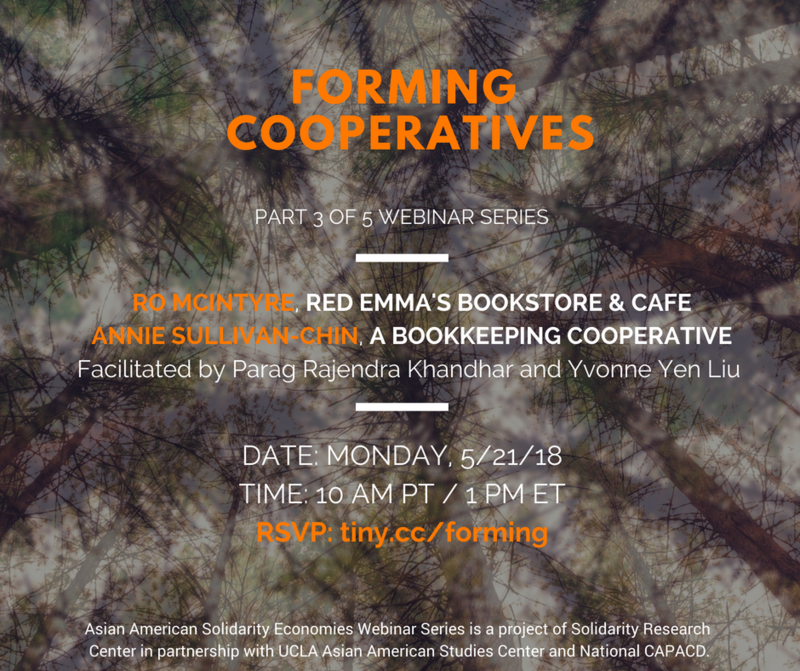 In our third of five webinars, our speakers will introduce the steps involved in forming a cooperative including deciding on its legal entity, cooperative finances, and governance and decision making. 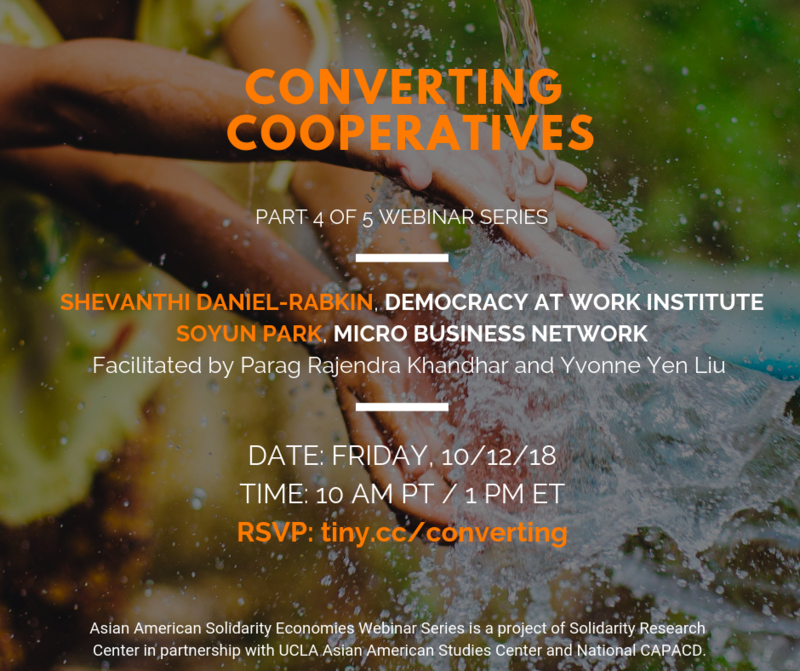 In our fourth of five webinars, our speakers will discuss legacy business conversions into cooperatives and how existing micro-business can work together in cooperative ways. Shevanthi (Shev) is passionate about the intersection of sustainable business and economic development. Her work spans over fifteen years in community and labor organizing, and strategic capacity building with nonprofit and small businesses. She previously served as Lead Manager of Worker Cooperative Initiative at Pinchot University – Center for Inclusive Entrepreneurship, and also helped develop a Cooperative Management Certificate program at Pinchot University. Shevanthi has managed and implemented large-scale labor organizing and worker justice campaigns with SEIU1199 NW, and programs centered on civil rights and social justice leadership, in rural and urban centers across the country, as well as solidarity work in South Africa, Nicaragua and Ethiopia. Shevanthi is also a co-founder of the O’Dell Education Center, a nonviolence direct action and leadership academy in Washington State, owned and operated by the Institute for Community Leadership. She is also Executive Board member at the Center for Women in Democracy, strengthening women’s capacity and leadership in public and private sector. Shevanthi has an MBA in Sustainable Business from Pinchot University and BA in History and Anthropology from University of Washington. 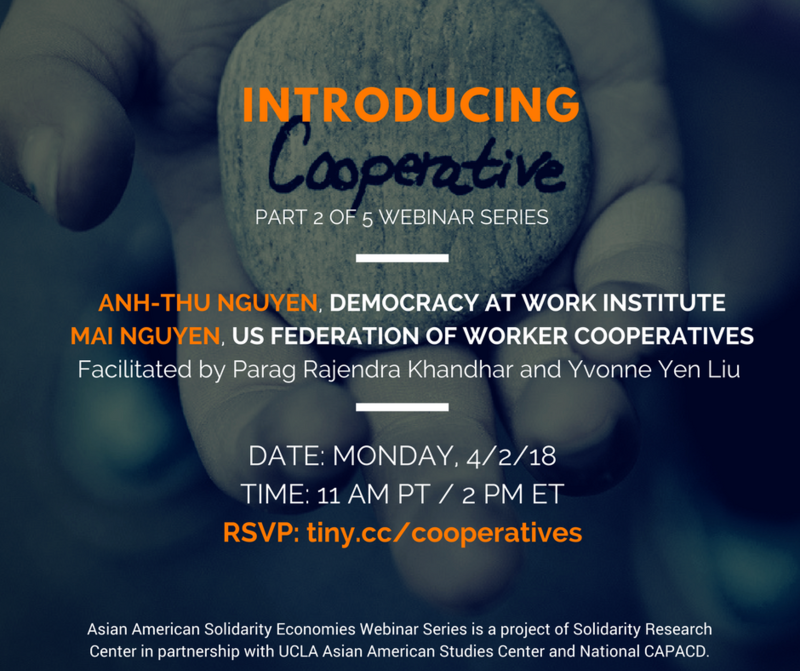 In our last of five webinars, our speakers will discuss how to incubate cooperatives as a community-based organization or worker center. 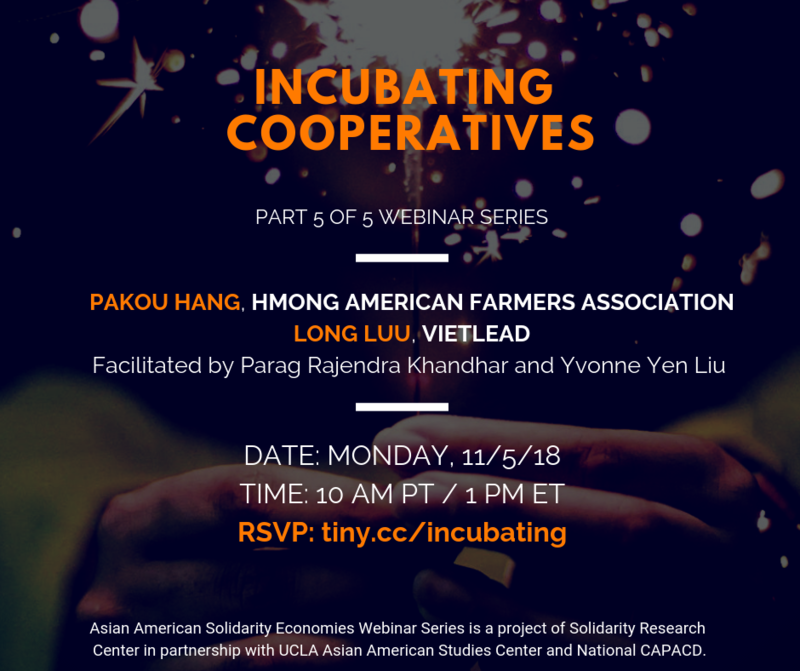 Asian American Solidarity Economies Webinar Series is a project of Solidarity Research Center in partnership with UCLA Asian American Studies Center and National CAPACD.